A new tub in a day? Yes, we did it and you can too. I told you earlier this week about getting a Bath Fitter consultation. We decided to go for it and have our custom bathtub manufactured and installed. I took a ton of pictures of the process as well as a time lapse video. 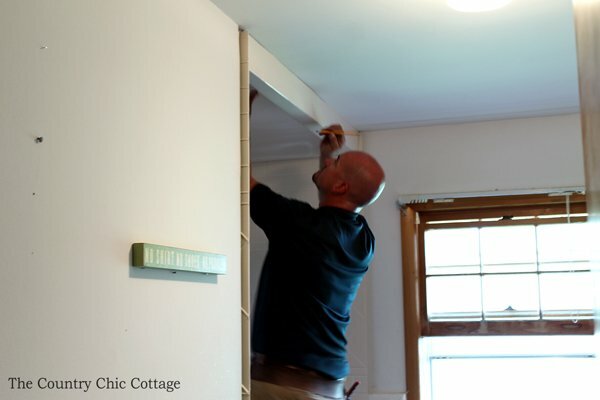 If you have ever considered a Bath Fitter remodel, this post is for you! I will describe everything about the process. Then stay tuned, because next week I will reveal the final images of this bathroom and give you my thoughts on the entire experience. This is one series that you do not want to miss. This post is sponsored by Bath Fitter however all opinions and statements are my own. 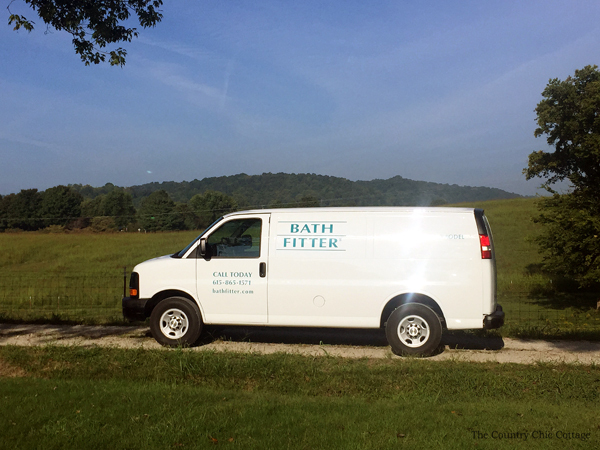 Psst…don’t forget that you can click here to schedule a consultation with Bath Fitter online or call (888) 985-5122. Our installer arrived in just a regular van. Now how is a complete bath remodel in that small van? I am going to show you! You can see from right to left in the image below the ceiling, the walls, and the bathtub still in the van. The walls are custom made and formed in the factory, however they curl up for shipment. Brilliant, right? The great part about the Bath Fitter is that the measurements for YOUR tub are sent to one of Bath Fitter’s North American manufacturing plants to custom-make your bathtub. In my case, the bathtub was made right here in Tennessee. My custom bath room remodel is American made! Bath Fitter actually uses a thermoforming process that molds the new bathtub to fit perfectly over the top of existing bathtub. There was of course some prep work that had to be done before the actual installation could occur. Our installer (Hi, Adam!) was able to do everything we needed in the bathroom. 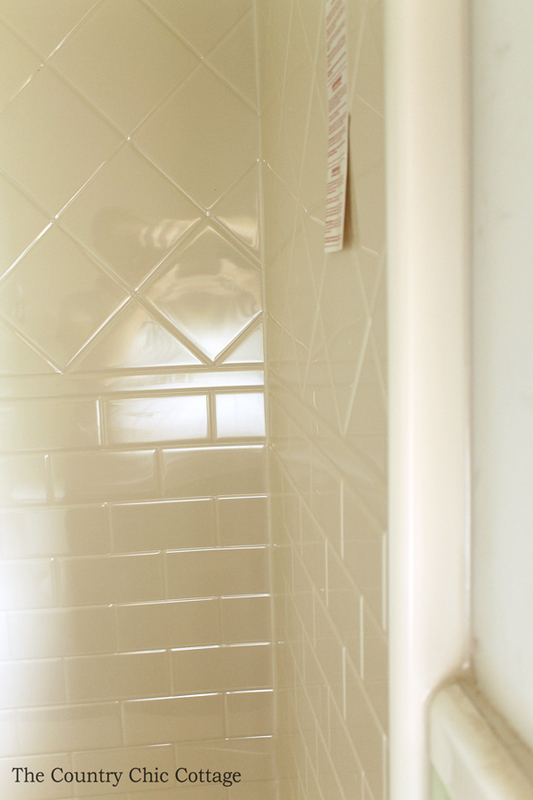 Yes – one guy remodeled our bathroom in one day! Awesome, right? 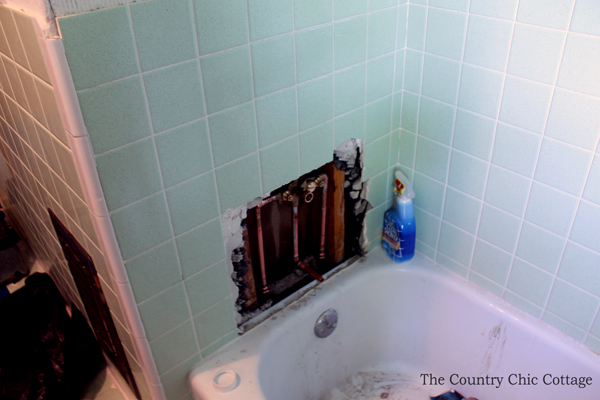 He started with the plumbing because this bathroom was not plumbed for a shower. Once all of the plumbing and prep work was completed, the exciting parts started happening! The walls were brought in first. Our installer made sure to level up the old walls of this house before installation. 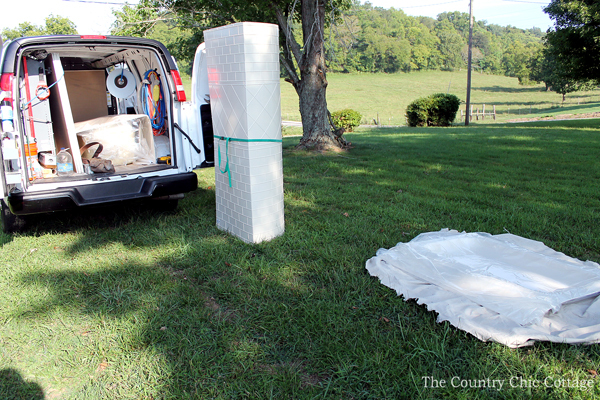 The walls are one piece with no seams,which guarantees no leaks down the road. You can note in the image below that the Bath Fitter installer laid out runners in the house to walk on. The mess was minimal and he cleaned every single bit of it up before leaving – that alone is amazing. The new bathtub is installed right over your old one. This means there was less demolition, less mess, and a shorter installation time. 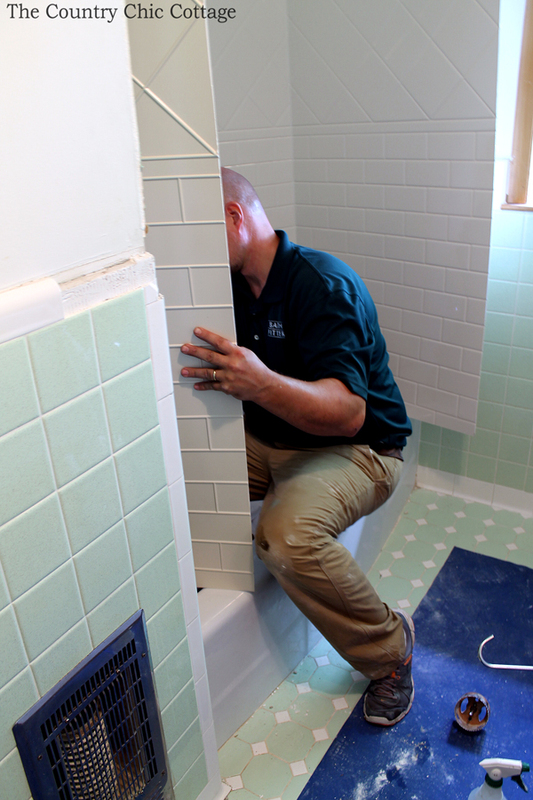 The installer cleans the existing tub before installing and caulks around EVERYTHING once installed for an air and water tight seal. It was really starting to look like something once that tub was slipped into place. We added the option of a dome ceiling to our package as well. The final cut was done on site for a perfect fit. Everything about the installation is trimmed out to blend perfectly with your existing bathroom. If you want to spend about 1 minute, you can actually watch the video below to see the bathtub installation at hyper speed! I was able to get this behind the scenes look for you with the cooperation of the folks at Bath Fitter. You can see step by step how the walls, bathtub, and ceiling were installed. Now for a few shots of the bath tub after the installation. These shots were taken around 3 pm on the day of the installation. The installer arrived around 9 am. That, folks, is one quick bathroom remodel! I thought I would take a few shots in this post to show you the details of the product. I will be doing another post next week with a full reveal of this bathroom that y’all do not want to miss. I mentioned the walls before, but check out the detail in the image below. You can pick whatever type of look that you love from a wide variety of options. You can also see the trim in the image below and how it goes right up next to the wall and the existing tile. Here is a view of the new dome ceiling that we picked for our installation. This bathroom does not have a fan so we went with this option to try and keep the moisture in the bathtub area. Now for a couple of before and after shots. This gives you an idea of just how amazing the transformation can be. This is the faucet itself. Now remember the Bath Fitter installer did all of the plumbing and installed that faucet and shower himself. He was the only one that had to come to our house and we did not have to hire out any more of the work. 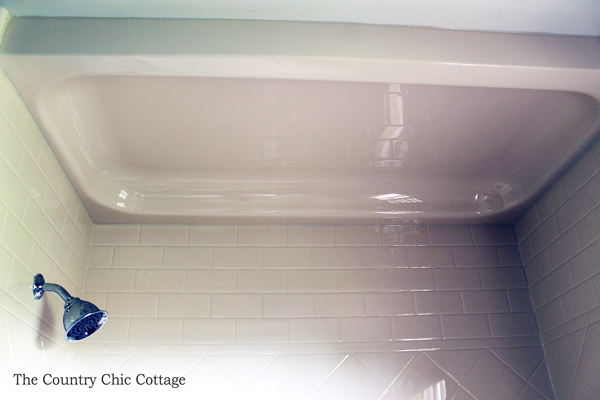 And finally, the part you may have been waiting on….the tub! 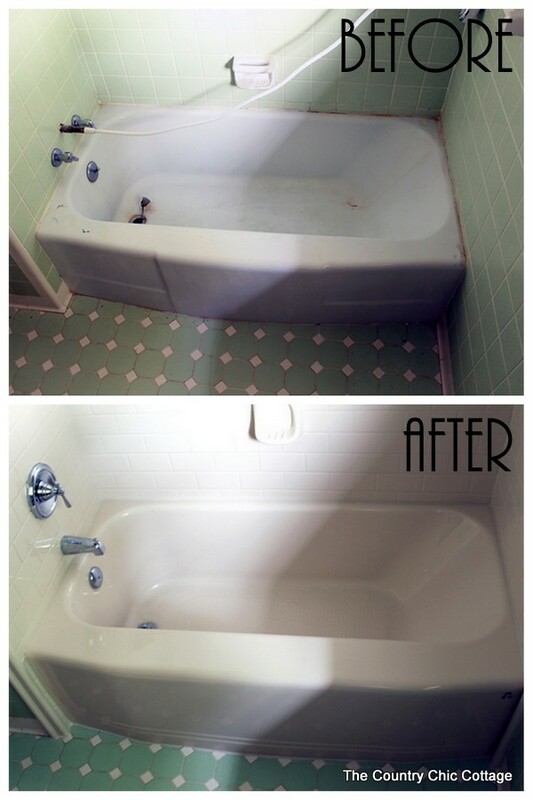 This is the before and after shots of just the tub for you. You can see there is a HUGE difference and this all happened in one day, y’all. Stay tuned for a full bathroom reveal including accessories, plus a special video testimonial from yours truly all about the entire Bath Fitter experience. In the meantime, if you want an idea of just what your bathroom can look like with Bath Fitter, be sure to design your own bathroom online before calling. Then you can click here to schedule a consultation with Bath Fitter online or call (888) 985-5122. Wow, that looks awesome! I can’t believe it was done in just one day! Great transformation! I need to look into this for our guest bathroom – it is so gross! Thanks for sharing about BathFitter. Dadgumit, had comment almost done and lost it. My blasted arthritic fingers go all over. love your mint green tile and on your floor. You might be sick of them but I love them. Sure looks great in your new tub area. How old is your home? I noticed the wall heater on wall just outside your tub. Don’t see that except in older homes. And if I wasn’t so old wouldn’t know that. Your property is so pretty, miss that from KY. Wish we could get that done in our bathroom but we have a garden tub, separate shower. I just get to clean tub, not lounge in it, takes too much water. I really despise our shower door. Enjoy your new bathroom. Look forward to seeing whole reveal. We have a bathroom with a garden tub as well! I agree…too much water!! The house this bathroom is in was built I believe in the 1950s. And yes still with wall heaters! 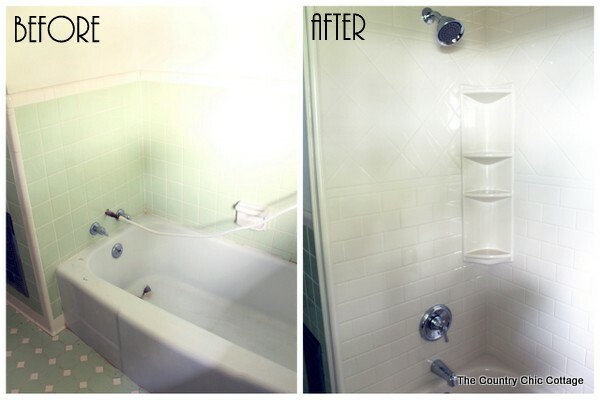 So Bathfitter does good work and can improve the look of an old bathroom. My wife and I moved into a home that was owned by an older couple. They had Bathfitter put plastic not only in the shower and ceiling but on the walls outside the shower as well. I hate the way it looks. I was told that the plastic cannot be taken off because of the glue they use. It will pull the cement board out apparently it’s so strong. Help me. If someone knows a method that will not create a lot of work please let me know! I personally love what we had done. It is a strong adhesive and I don’t know of a way to remove it. I need a bathtub fitter only over my tub. May I her an estimate? You will need to contact them for an estimate! Thanks for reading!